Communal farm-to-table dinners at The Table. Built on a cliff overlooking Kulaniapia Falls, the Inn offers a range of accommodations for adventerous guests who appreciate all the comforts of home. All guest rooms are individually furnished, with private bathrooms, and accommodate 2 guests. Some rooms accommodate 3 guests with a roll-away / sofa bed. Inn guests enjoy complimentary breakfast and access to Kulaniapia Falls. Luxury canvas pods with access to a shared kitchen with ocean views. Next door to the Inn is Kulaniapia Farms, where we grow food to support our community, and provide an educational experience for our guests. 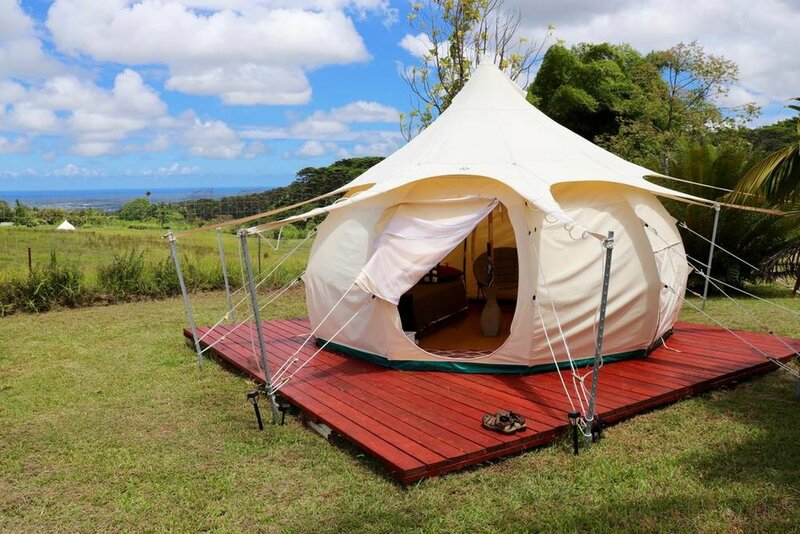 The Farm provides a limited number of luxury canvas pods, with hot showers, shared bathrooms, and access to a 2000 square foot commons with a full kitchen and sweeping views of Maunakea and Hilo Bay. NOTE: Access to Kulaniapia Falls is provided to Farm guests with a $29 guest pass. This fee is waived with the purchase of any Kulaniapia Adventure.